Gallia Antiqua in Provincias et Populos divisa. 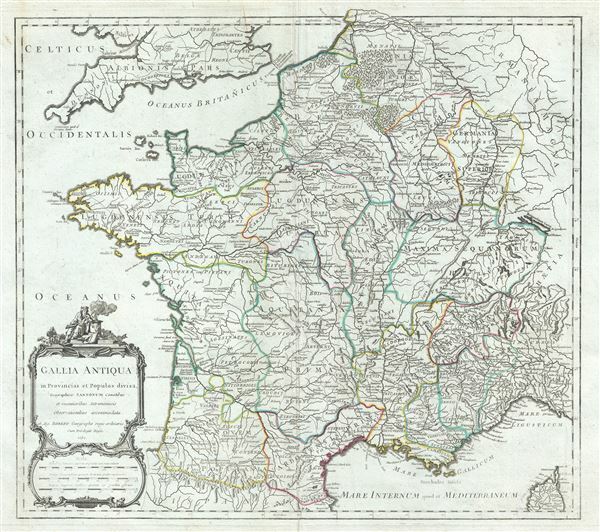 This is an attractive 1750 map of France or Gaul or Gallia by Robert de Vaugondy. It covers Gallia during ancient Roman times and extends from the English Channel south as far as the Pyrenees Mountains and Hispania. It includes the modern day nations of France, Luxembourg, Belgium, Switzerland and the Netherlands. It identifies several important cities and towns and uses ancient names throughout. The Roman provinces of Lugdunensis, Narbonensis, Aquitania and Belgica are also noted. Gaul or Gallia was the ancient name of a region of Western Europe which comprises of modern day France, Luxembourg, Belgium, most of Switzerland and Germany west of the Rhine. After the Gallic Wars of 58-51 BC, all of Gaul came under the control of the Romans. It continued under Roman control for almost 500 years before it fell to the Franks in AD 486. The Gallic Wars are believed to have been fought primarily to provide Caesar with wealth and popularity and to boost his political career rather than being a defensive action as described by Caesar. The campaigns are described by Caesar in his book Commentarii de Bello Gallico. The lower left quadrant depicts a beautifully engraved title cartouche. This map was drawn by Robert de Vaugondy in 1750 and published in the 1757 issue of his Atlas Universal. The Atlas Universal was one of the first atlases based upon actual surveys. Therefore, this map is highly accurate (for the period) and has most contemporary town names correct, though historic names are, in many cases, incorrect or omitted. Very good. Original platemark visible. Minor wear along original centerfold, with verso repair over bottom margin. Minor spotting and offsetting. Rumsey 3353.006. Pedley, Mary Sponberg Belle et Utile: The Work of the Robert de Vaugondy Family of Mapmakers, 92.